Knowing the distance of an astrophysical object is key to understanding its formation and evolution: without an accurate distance, we do not know how bright it is, how large it is, or even when it existed. Astronomical distance measurements are challenging tasks, and indeed the typical information we have about Galactic and extragalactic sources are its position (perhaps as a function of time) and its brightness (as a function of wavelength and time). The first modern milestone in the estimate of nearby distances dates back to the Hipparcos space mission (in the 1990s), which provided absolute trigonometric parallaxes at milliarcsecond-level precision across the whole sky, for more than 100,000 sources. Around the same time, and to the surprise of many scientists, the Fine Guide Sensor onboard the Hubble Space Telescope (which was designed to guide the telescope) was used as a scientific instrument and provided exquisite trigonometric parallaxes for a handful of primary distance indicators (Cepheids, RR Lyrae, δ Scuti variables). In addition, during the past 10–15 years, the use of ground-based 8–10 m-class optical and near-infrared telescopes and space observatories have provided an unprecedented wealth of accurate photometric and spectroscopic data for stars and galaxies in the Local Group (D < 1 Mpc) and in the Local Volume (D < 25 Mpc). Moreover, interferometric radio observations have also achieved 10 micro-arsecond astrometric accuracy. 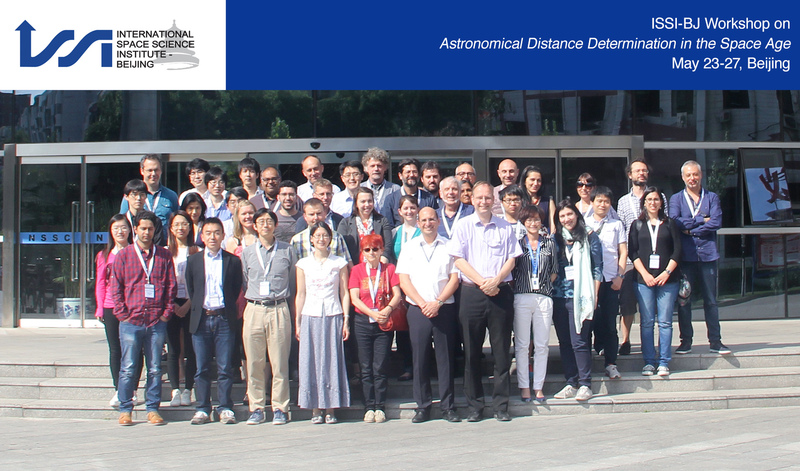 This ISSI-BJ workshop will highlight the tremendous amount of recent and continuing research into a myriad of exciting and promising aspects of accurately pinning down the cosmic distance scale. 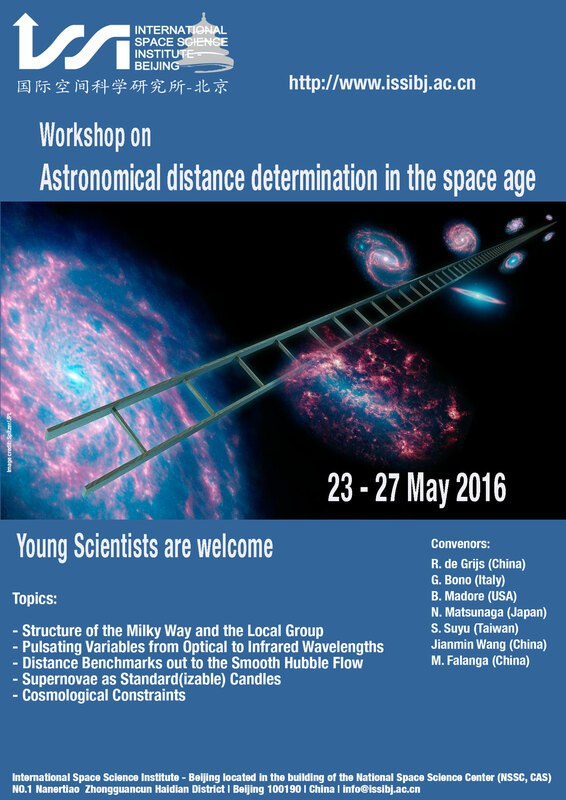 Putting the many recent results and new developments into the broader context of the physics driving cosmic distance determination is the next logical step, which will benefit from the combined efforts of theorists, observers and modellers working on a large variety of spatial scales, and spanning a wide range of expertise. We will specifically address future efforts in this field, both theoretically and observationally. We plan to address the impact that accurate cosmic distances will have, together with the new and unprecedented near-infrared spectroscopic opportunities offered by the James Webb Space Telescope, on metallicity gradients in nearby galaxies. This is a critical time in the context of firming up the astronomical distance scale: VLBI (very long baseline interferometry) sensitivity is being expanded allowing, for example, direct measurement of distances throughout the Milky Way and to Local Group (D < 1 Mpc) galaxies. The field will benefit tremendously in the Gaia era, which is now truly upon us. The first science verification data obtained with Gaia will soon be made available publicly (late 2015). 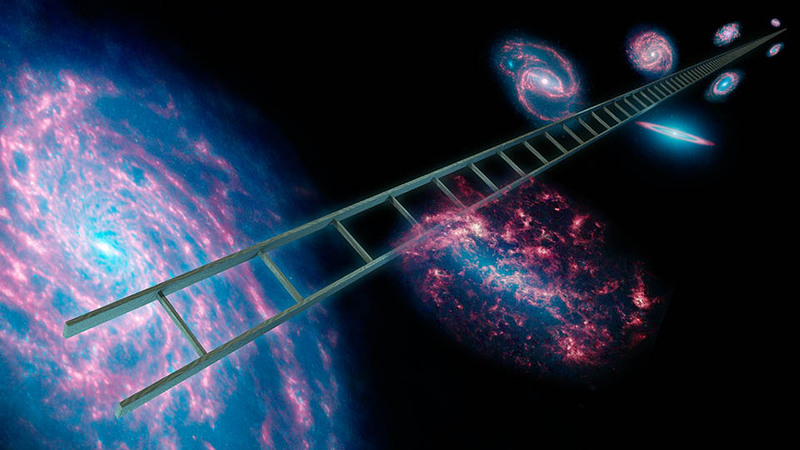 In addition, the next-generation “extremely large telescopes” (ELTs) will play a crucial role in cosmic distance determination, since they will allow us to determine the Hubble constant only using primary distance indicators. Significant modeling efforts are currently underway to prepare the community for use of the Thirty Meter Telescope (USA, Japan, China, India), the European ELT (ESO) and the Giant Magellan Telescope (California, South Korea, Taiwan). Space-based observatories, in particular, are allowing major advances to be made, and this will only increase in the next decade. In addition to the European Hipparcos and Gaia missions, Asian scientists, in particular our Japanese colleagues, are leading the field in relevant space mission. Nano-, micro- and (full) JASMINE, as well as the Japanese space interferometry missions VSOP/ VSOP-2 complement Russian efforts related to eRosita, in addition to US and European space missions like the Hubble and Spitzer Space Telescopes, WFIRST, Herschel, WMAP and Planck. These space- and ground-based facilities will have an immediate bearing on the astronomical distance scale. Nevertheless, many uncertainties remain at the level of at least 5–10%, particularly in terms of our understanding of the physics underlying many of the methods commonly used for distance determination.